A view from the water of the University of Miami’ Rosenstiel School of Marine & Atmospheric Science campus on Virginia Key. Today was a day filled with post-conference fieldtrips for attendees to choose from. 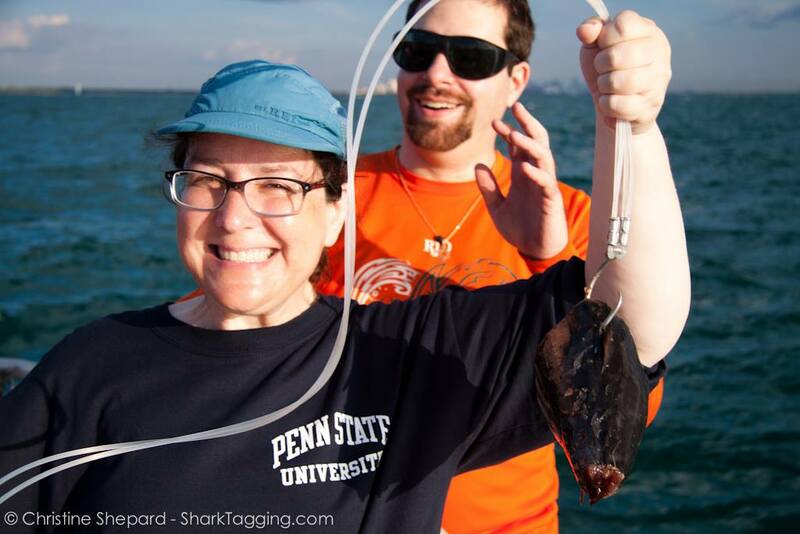 Since I went to graduate school in this area and spent alot of time in the Keys and Everglades for my dissertation research, there was one option for me that would be a completely new experience – the shark tagging trip! I know that not all of my students would have found the following description attractive, but getting wet and dirty for science is just my thing! Spend a ½ day tagging sharks with local scientists from the University of Miami’s RJ Dunlap Marine Conservation Program (SharkTagging.com). There is a morning and an afternoon trip available. Maximum of 20 participants on each trip. Please bring closed-toed shoes (NOT flip flops) and clothes that you don’t mind getting wet and covered in bait. What excited me the most about this trip is that it was not a “show and tell” fieldtrip, where I would going somewhere and looking at outcrops or aquarium animals in a tank. This fieldtrip was a research experience, a real opportunity to do shark research conducted at the University of Miami. How often do you get a chance to say you participated in and contributed to shark research???? Loading up our boat to head out in the early morning to search for sharks! 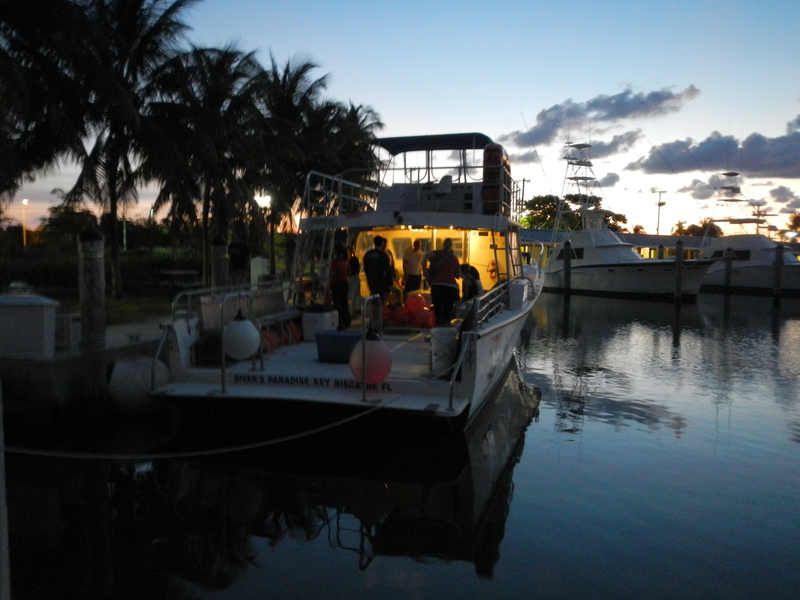 At 6:30AM, an enthusiastic group of us loaded up some vans at the hotel and headed out to a marina on Key Biscayne for a shark tagging trip organized by the University of Miami’s RJ Dunlap Marine Conservation Program. Six members of the RJD Lab had us sign waivers and the ship’s log, then we had to go around and introduce ourselves and state our favorite shark (I wasn’t ready for that question! I said the hammerhead, but now I realize I should have said the sawtooth or extinct Carcharodon!). We learned alot about the education and outreach mission of the RJD Program, as well as basic information about sharks (did you know that you are more likely to get bitten on the New York City subway than you are bitten by a shark???). The RJD website has a great FAQ page if you are interested in learning more about their program and research. We drove out of the marina and headed offshore. We received some great information and were actually able to help deploy the fishing gear, complete with fresh tuna heads on hooks to lure the sharks. We then divided into teams and learned what work we would do on the captured sharks before they were released, such as taking measurements of length, clipping the dorsal fin for ecotoxicology analysis, collecting muscle tissue for more toxicology analysis, and inserting a tag with contact information for the RJD Lab in case anyone catches/finds the shark. 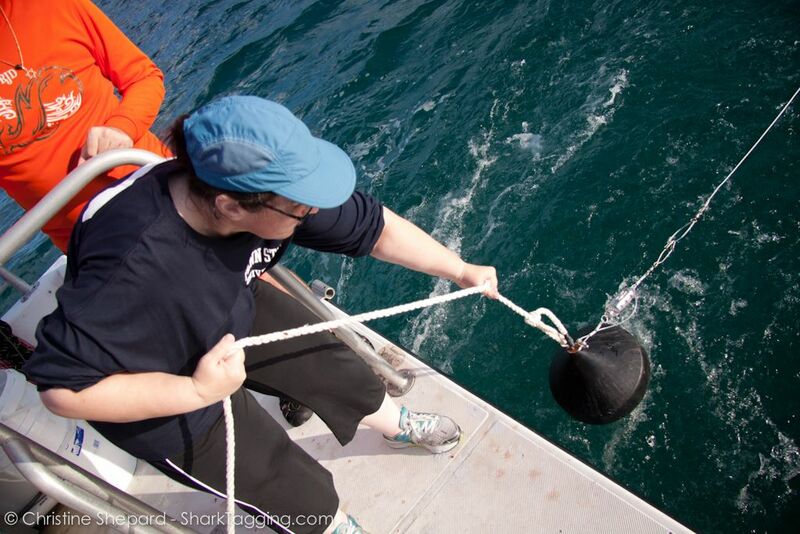 My duties were going to be squirting water in to the eyes of the shark once it was brought out of the water to test its reaction at the beginning and end of the shark capture/release – which all had to take place in 3 minutes worth of time! That’s me with shark bait that I’m about to lower over the back of the boat. Lowering the gear, looking to catch some sharks. We sent 25 drumlines over the side of the boat (a drumline is a stationary, self-contained fishing unit comprised of a baited circle hook on monofilament fishing line attached via swivel to heavy weight, which is attached to a set of floats signaling its location. The swivel allows for hooked fish to swim freely around the weight in large circles, passing water through its gills and reducing stress. (from RJD)), and we had to wait 45 minutes before going back and pulling them up to see what we had caught. Several of the early lines we pulled up were missing their bait, which means “something” was down there feeding! So we continued to pull up the lines one by one… and one by one, they were empty. Yes, an entire morning of a shark tagging trip – without tagging one shark. This was incredibly disappointing! But, it is also the reality of doing science. As I share with students that do independent study work with me, having no data is data in itself. It makes me feel a little better that another group of conference attendees that went out only came up with one shark. The RJD crew told us that in the past seven years that this shark tagging program has existed, with 50-100 shark tagging trips a year, only seven trips have turned up zero sharks…. and yes, my trip makes #8. 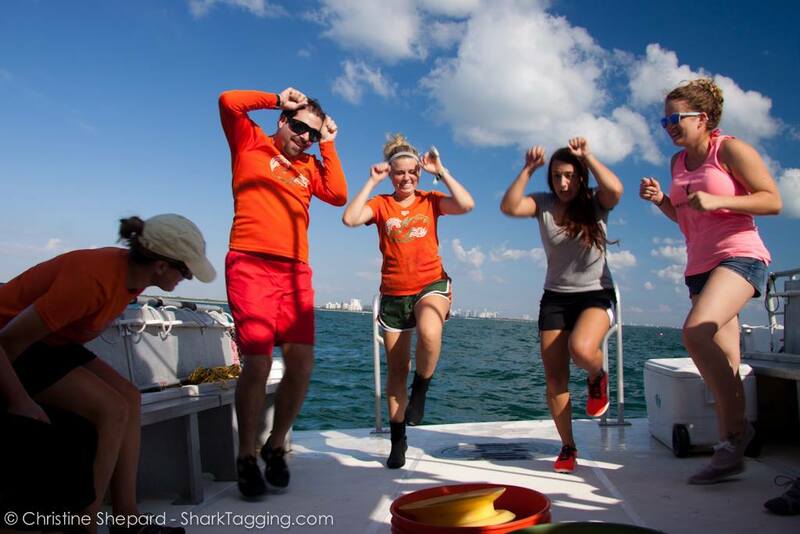 Our field leaders doing the good luck shark dance to bring the sharks to our lines. At this part, they are doing the bull shark move. Group photo from our boat. At least I can enjoy the virtual shark tagging expedition on the RJD Program website, which has videos and a great overview of what we did and the equipment used. And the next time I am in Miami, I will try my luck a second time. 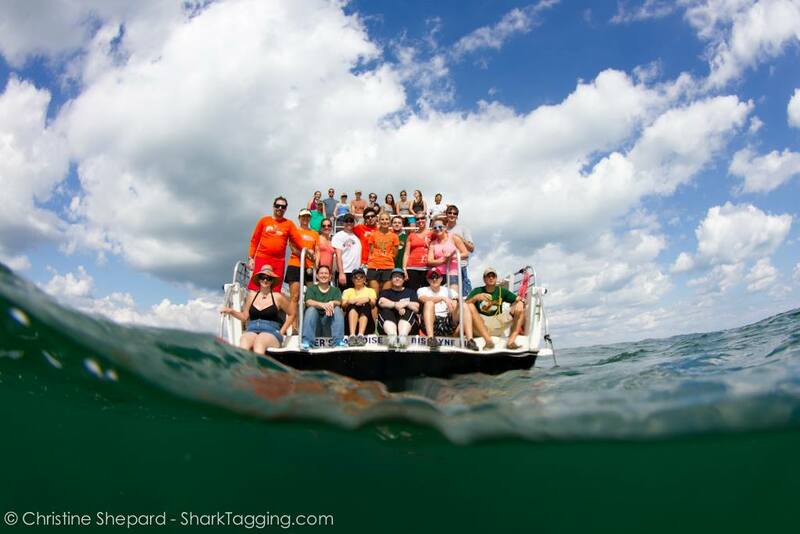 RJD Lab, save a spot for me on a future shark tagging trip! Any students want to “tag” along with me?